The European flat glass industry is fully committed to developing products with the smallest environmental burden and the greatest benefits. To do so, it continuously improves the energy efficiency and environmental performance of its manufacturing activities and of its products. Life Cycle Assessment (LCA) provides the best framework to assess and determine the environmental impacts of products. As such it helps orientate improvements towards even greater sustainability. Complete LCA analysis take account of the environmental impact of manufacturing products but also the impacts and benefits of products in their use phase as well as their recyclability at their end-of-life. In order to support the environmental assessment of final building products made of float glass such as windows, facades, etc. 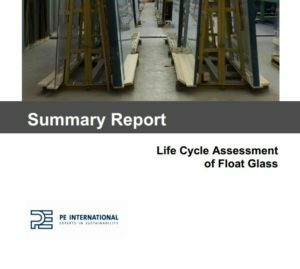 Glass for Europe carried out a “cradle-to-gate” life cycle study of clear float glass for building applications.